Hideki! – I need new hobbies. This news makes me very happy. 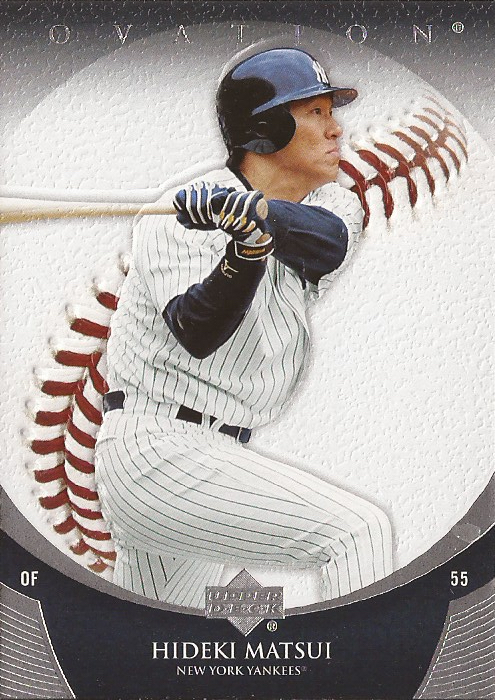 He was one of the last Yankees that joined the team while I was still rooting for them who I really liked (I liked Robbie Cano OK, too, but not as much as I liked Hideki Matsui), I saw his entire career with them, and I’m still collecting his cards when I happen upon them. 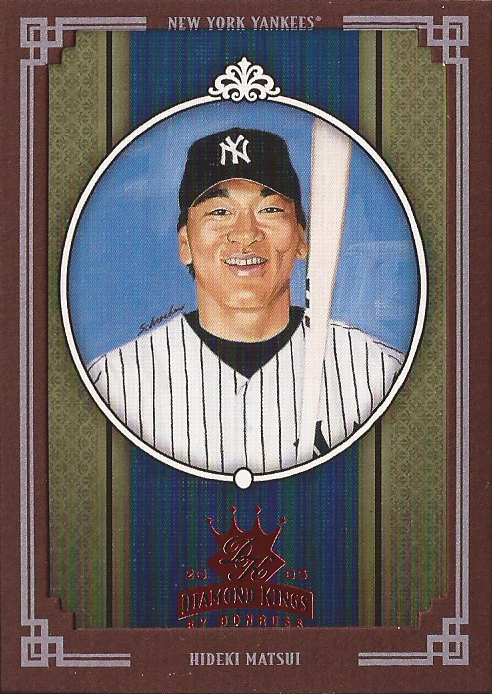 I’m pretty hit and miss on Diamond Kings painted cards, but I like this one, and the borders are especially nice. …Fleer? Gone as well. Love these borders, though, and our hero looks pretty intense on the cards, too. More Upper Deck, and a cool, textured card with another fun picture on it. 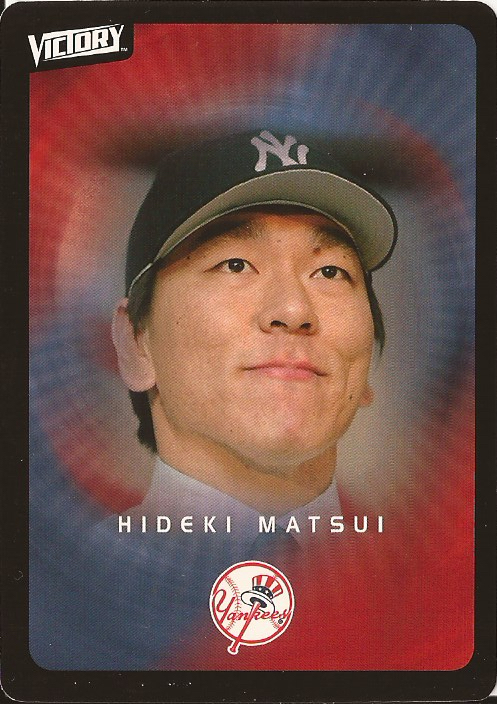 Had a few “Hideki Loses His Hat” cards in my stash, but this was the best. 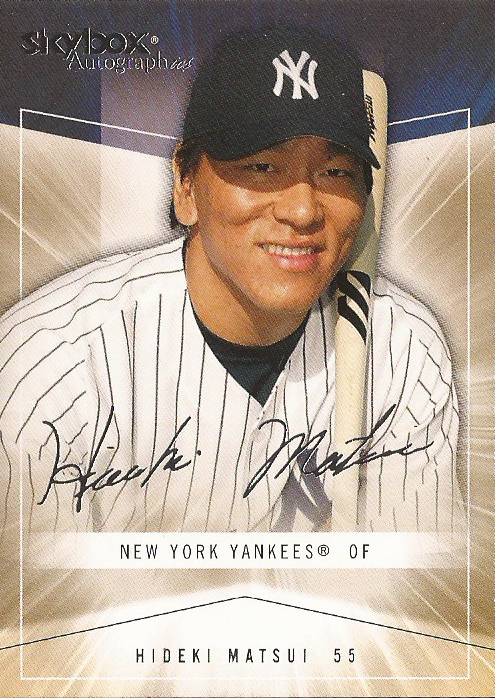 And, of course, a Yankee Stadium Legacy card. 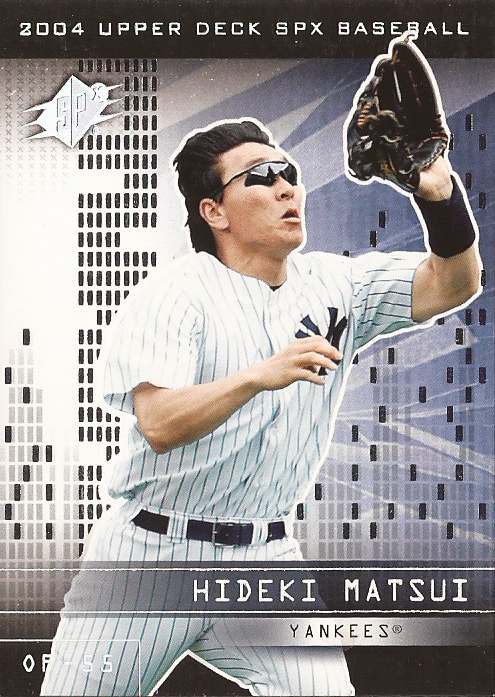 Have a few different Matsui picture cards (I cut bait on a lot of my YSLs a couple years back, but I kept one of every picture variation for the players I like and collect). This one’s also nice because he homered in the game. That’s 7 modern cards, and no Topps! Looking at The Trading Card Database, I see (but have no idea how I’d never noticed previously) that he didn’t have a proper Topps license until ’05, and was only really in their products until ’10. No Rays cards outside of ’12 and ’13 Bunt, I don’t think (and I have the ’13 color one, but not the ’12 black and white there), and he was only in Attax in ’11. 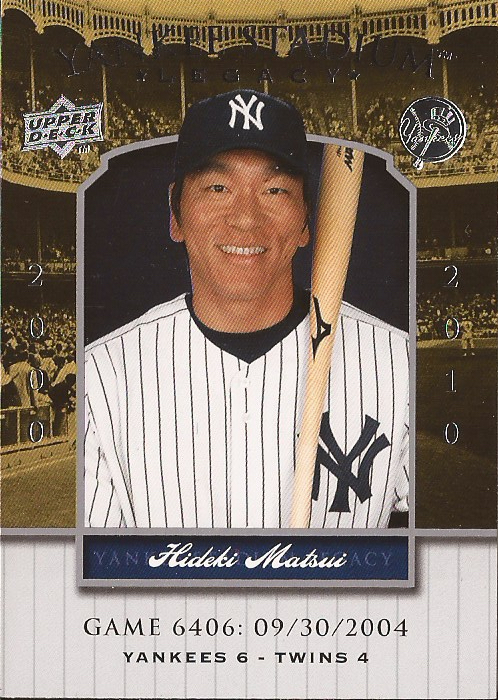 Of those, I still definitely (and surprisingly; I had a monster box of ex-Yankees sold to me a few years back that had tons of Matsuis in it) need ’06 Ginter, ’08 Chrome and Heritage, ’10 Topps 206 and ’11 Attax (regular or foil), so if anyone’s holding on any of these, I’d be happy to take them off your hands. I also don’t have any autographs (good luck with that, from what I can see) or relics of his, so I’d be up for getting those. (I probably don’t have the trade bait to get an auto, if I’m being honest, and I definitely don’t have the dough.) If I had to pick one relic, I’d aim for the ’06 Ginter mini relic (Ginter framed mini relics are kinda my go-to for relics now, if I can get ’em, though I like any of the Topps framed mini relics), but I’m not picky and will take whatever’s available. 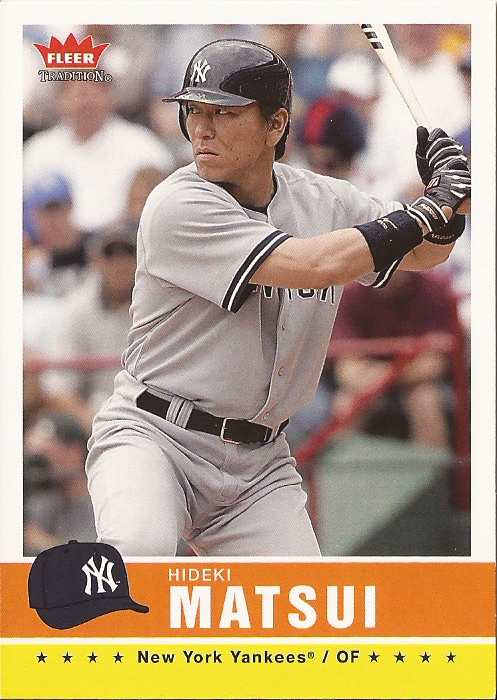 And, finally, I am reasonably sure that I’ve got no cards of him from Japan. Ryan, how often do you come across those, and how affordable are they? I mean, I’ll take ’em from anyone, but Ryan’s actually in Japan these days, so he’s probably got the easiest line on them. But yes, get in touch if you’ve got any of that stuff. I don’t do enough fun stuff toward my player collections, and a Hall of Fame election (probably the only one he’ll ever see, despite being a groundbreaking player) is as good a reason as any to do a little legwork on that. Whoop! I’m glad he made it in! Love this guy. The card of him losing his hat is great. I was lucky enough to get him TTM a while back. Don’t think I’d be able to score any of his certified autographs. Yeah, lookin’ at eBay solds, they’re starting around $80 at the moment. Guy’s got some fan base and not a lot of product. Previous Previous post: Decided on the music split!